For those of you wondering, I definitely did not shoot any of my fashion week outfits in New York. I knew the weather was going to be crazy cold, so I decided to photograph each look beforehand. I didn’t want to risk snow, nearly subzero temps, etc for outfit photos. Sorry guys! 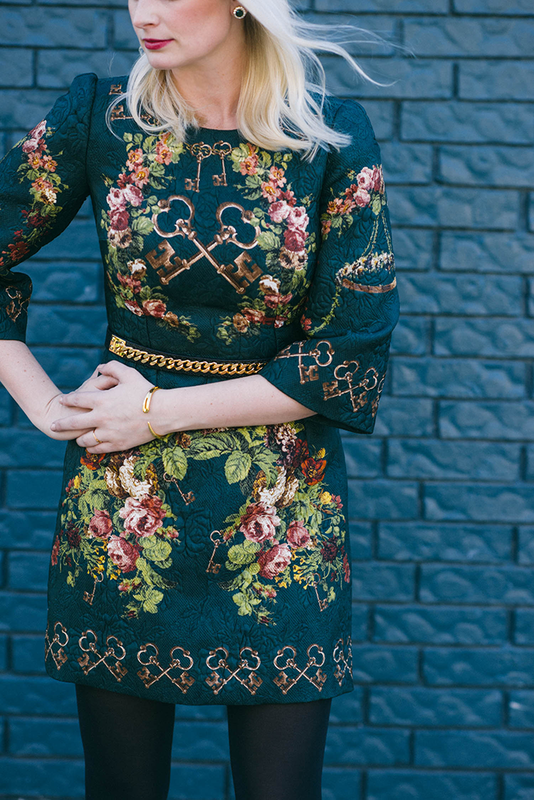 I wore this dress on the last day of fashion week, but ended up styling it a little differently (see my look here). It was just too cold and icy to wear my pumps, so I opted for my Stuart Weitzman over-the-knee boots instead. I also topped it with the fur jacket I wore in Wednesday’s post – I stayed pretty warm, but it would have been nice to have some earmuffs! I scored this Dolce & Gabbana number during the after-Christmas sale at Neiman Marcus back in December! It was the only one left and just so happened to be in a size 6! Before I started losing weight these last few months, I’d been consistently wearing a size 8, so when I first saw the number 42 (Italian speak for size 6) I was a little worried, especially since Dolce & Gabbana tends to run small. At the time when I tried it on, I’ll admit it was a bit snug, but I still had a month before fashion week to lose those extra (and super stubborn) 5-10 pounds. I decided to take the plunge. When I tried it on again to shoot it before fashion week, it fit me like a glove. It was perfect! This is one of those pieces that I’ll have forever. 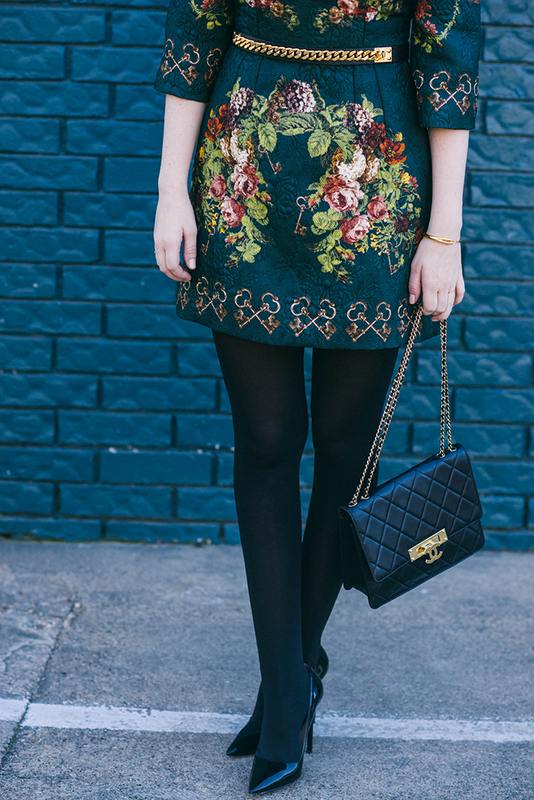 It’s a classic silhouette with a fun print that will totally stand the test of time. Can’t wait to pull this frock back out for holiday parties next year! While this particular style is sold out, this exact key print is available in a longer dress style! A few more D & G key prints to check out include this black shift, this combo dress, this strapless cocktail number, and this long-sleeved dress. The best part? All of these are on sale. Oh, and gimme these earrings. Shop more Dolce & Gabbana key prints below! PS – If you’re in the Dallas area, don’t miss my event with Glamour Magazine at European Wax Center tomorrow afternoon! Stop by the Preston Royal location between 2-5pm for brow treatments, mini makeovers, three amazing giveaways and more! Click here for all the details and to RSVP! Hope to see all of you there!!! that dress is stunning, ok this is my favorite look from you. And congrats on losing those stubborn pounds you need to tell me how you did it. 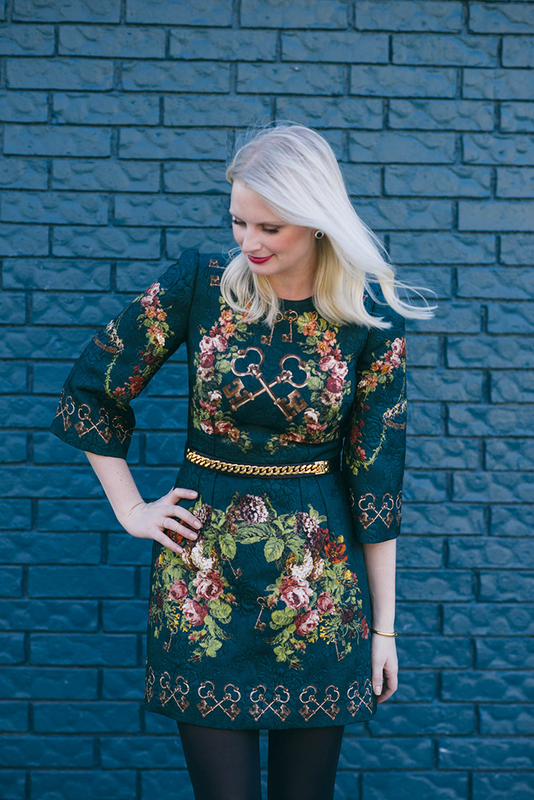 This dress is beautiful and is so flattering on you! Definitely a classic piece you’ll keep forever… aka the best kind of purchase!! You look fantastic! And that dress is beautiful, a true classic. I love D&G. This dress is to die for and looks absolutely stunning on you! You look SO good, Merritt! 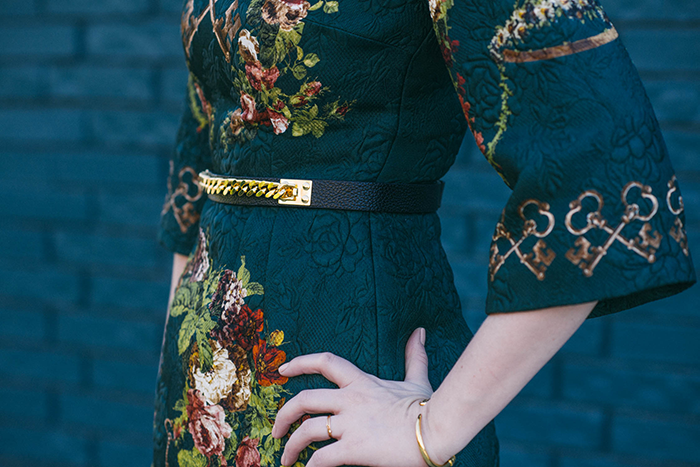 Absolutely perfect silhouette on you & love how you belted it! This dress is GORGEOUS!!! Agreed, it is my favorite look on you! That dress was made for that Sophie Hulme belt!! This dress is ahhhhmaziung. I love the dark color. So smart to photograph it beforehand. I loved how you styled it for the cold too. What a phenomenal dress! Saw the instagram… gorgeous, though the no jacket in 2 degrees is a little crazy, lady. :) looking gorgeous! hope you had a fab week. that was just for the Instagram photo – I had a fur coat! Amazing look! This dress is gorgeous! These colours look perfect on you. That dress is amazing, Merritt!! LOVE this dress! The color, shape and print are exquisite! Looooooove this dress!! You look stunning! I LOVE this dress. Swoon. You look beautiful! You look amazing! You are so right, that dress fits you like a glove. Gorgeous! Also, you a very smart…I took pics of my outfits in NYFW and it wasn’t fun :( Next I will try to shoot them before like you did. Thanks for sharing! Have a great time at your event tomorrow. You look great skinny mama! Love your elegance no matter what you wear! You look stunning on that D&G dress. Glad to hear that you had a good time in NYFW even if it was too cold. Have a nice day! This dress is incredible on you, absolutely stunning. And so smart to shoot beforehand! It’s been brutal shooting in the cold!! This color is so pretty on you, such a darling look!! ADORE this on you (it looks particularly fabulous with your hair!) Dolce & Gabbana do baroque so well!